In November of 1983, CEO of the Heineken beer company Freddy Heineken, along with his driver Ab Doderer, was kidnapped by a group of amateur criminals. They got their ransom money, fled to various countries to hide out, and were eventually caught and imprisoned. I know that's a fairly flat and terse description of the crime in question, but you should see how dull it looks on film in KIDNAPPING MR. HEINEKEN. The cast is solid, headed up by Sam Worthington as criminal ringleader Willem Holleeder, with Anthony Hopkins picking up an easy paycheck for what was likely a day or two on the set as Heineken. 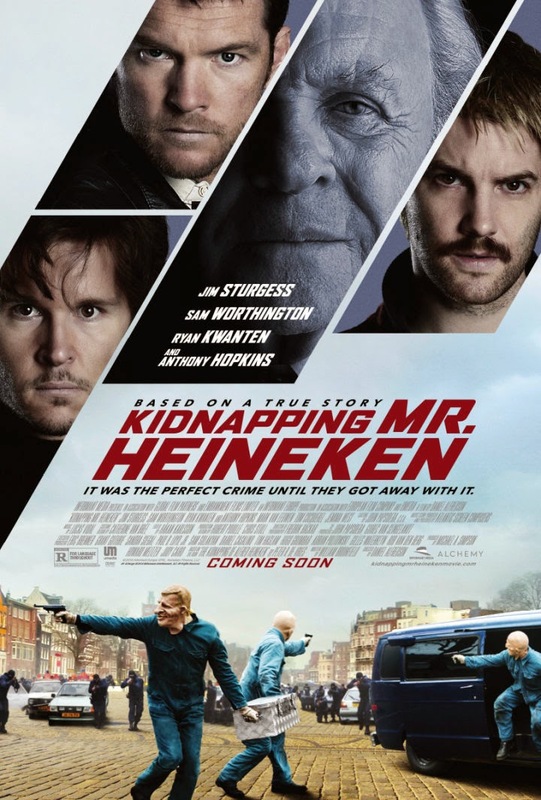 The screenplay is co-written by Peter R. de Vries, who literally wrote the book on this case (actually two books: The Heineken Case and The Kidnapping of Alfred Heineken), which no doubt is a big part of why events are depicted in a fairly accurate manner. Sadly, that's not enough to make for a gripping film. Director Frederick Alfredson turns these raw materials into a professional looking film, but one that displays none of the style and excitement he brought to previous works like his adaptations of THE GIRL WHO PLAYED WITH FIRE and THE GIRL WHO KICKED THE HORNETS' NEST. One feels almost guilty slagging a film like this, as it's not some cheap, shoddy piece of schlock. But whatever inherent interest the real case has (and there must be some, as this is the second film version of it), what's on screen here is severely lacking in drama. 2 out of 4 stars.